This hearty, Italian Instant Pot bean and pork stew is an absolute family favourite, featuring ground pork meat, juicy tomatoes and legumes of your choice. If you love an Italian minestrone or a good Bolognese sauce, you will love this gorgeous, Tuscan Instant Pot stew. It can be made with any ground meat of your choice – pork, turkey, chicken or beef – and is incredibly easy and quick to prepare. The dish is more plant-based than meat-heavy as we’re only using half a pound of meat for 4 servings, and it is full of fibre-rich legumes and nutritious veggies. You can modify this into a vegetarian dish by replacing the meat with diced mushrooms instead. It’s one of our favourite one-pot dishes the whole family will love. It freezes well and is delicious the day after, too. Here are some step-by-step pics to follow along with the recipe below. Prepare all the ingredients and turn on the Instant Pot. Press the Sauté function key and let the pot to heat up slightly. Add the olive oil, onion, celery and carrot with 1 teaspoon of salt and cook for 5 minutes, stirring a few times. Add the pork and diced bacon and cook together with the vegetables for about for 2-3 minutes, stirring through and breaking the meat apart with a spatula. Then, add the rest of the ingredients, except for fresh parsley and lemon juice, and stir through. Press Cancel/Keep Warm to stop the Sauté function. Place and lock the lid, making sure the steam valve is set to Sealing. Press Manual function, HIGH pressure and adjust the time to 6 minutes. After 3 beeps, the Instant Pot will start to build up the pressure, which will take about 5-7 minutes, and the cooking will begin. Once the timer goes off, allow 10 minutes for natural pressure release; then, use a quick pressure release method by carefully moving the valve to Venting. To finish the stew, stir in the lemon juice and parsley and serve with grated cheese on the side (if you wish). 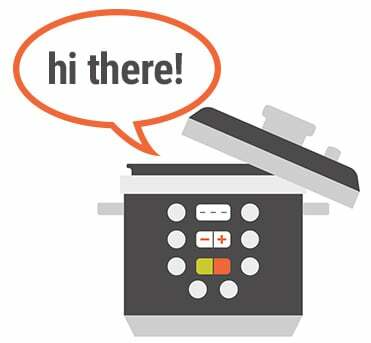 Follow us on Instagram and show what’re you making in your Instant Pot tonight! Tag @instantpoteats or use hashtag #instantpoteats.